*Since 2005, this is not entirely true; Standard and Poors switched to only counting shares in its index that are available for public trading (as opposed to all outstanding shares). Philip Fisher graduated from the Stanford Graduate School of Business Administration. After a brief stint in industry, he started an investment counseling firm on March 1, 1931, just a few years after the market crash of 1929. Fisher perceptively understood that due to the market crash, most investors were unhappy with their current investment advisers and this would prove to be an advantage for in his new business. As an investor, Fisher looked for companies that demonstrated a track record of above average growth and that possessed an above average management team. He believed that if you could find companies with these elements, that you could achieve above average investment returns by investing in the companies' stock. Fisher was impressed by companies that were able to grow sales and profits at rates greater than the industry average, believing that those companies possessed superior products and or services that made the growth possible. Fisher recognized the importance of having an adequate research and development program in a company in order to sustain the growth. Fisher also placed significant importance on a company's sales force, arguing that it was the link between the marketplace and a company's research and development efforts. It was the sales force that was in tune with the markets needs and could bring back valuable ideas from communication with customers. According to Fisher, sales growth needed to be accompanied by sufficient profit margins. Profit margins of exceptional businesses did not collapse during tough economic times the way they did with marginal businesses. Fisher looked for companies with healthy and durable profit margins, which had the added benefit of being able to generate enough internal cash to fund projects. To meet Fisher's investment standards, a company also needed to understand thoroughly its cost structure and be able to detect operational problems early by having adequate accounting controls in place. This ensured that a company could detect and correct problems at an early stage. Having a competent and capable management with sufficient depth ensured that long term plans could be implemented while still managing short term issues. Fisher was concerned with the honesty and integrity of management. He investigated whether management was acting in the best interests of shareholders. One way that Fisher used to evaluate management was by inspecting the way they communicated with shareholders particularly during bad times. He looked to see if management was still forthcoming and open when communicating with shareholders during difficult times. Fisher recommended that investors use "scuttlebutt investigation" as a way of determining the relative strengths and weaknesses of a company. Scuttlebutt investigation means you query former employees, managers, consultants and competitors of the company you are interested in. This investigation can paint a valuable profile of the company. Fisher also believed that holding fewer companies in a portfolio was fine, as long as those companies were were thoroughly investigated and within ones "circle of competence". International Paper (IP) is a paper and packaging manufacturer and distributor. Its stock price has fallen some 60% since last year, as it has faced tremendous increases in input costs and more recently faces a slowing global economy. Could this represent a value opportunity? There are several things to like about this company's stock price prospects going forward, while there are also some uncertainties. North America, Europe, Latin America, Russia, Asia and North Africa) it has been unable to avoid closing mills and reducing assets, thus sustaining declining revenue over the last decade. While the P/E of 7 and dividend yield of over 6% are appealing, the prevalent overcapacity in this industry makes it difficult to determine if this company's payout is sustainable. While the company does have plenty of liquidity ($4 billion in cash) to meet its obligations for the next couple of years, it has largely financed this cash by increasing its debt level from $6.7 billion to $9.6 billion last quarter, adding to its uncertainty in the longer term. Furthermore, over the last several years the company has been spending less on capital expenditures than it has been expensing in depreciation, suggesting it is not re-investing to maintain or grow its assets...therefore, the downward trend in revenue should continue going forward (barring blips here and there due to acquisitions). While the payout may be nice for the next several quarters, unless there is a change in this industry's dynamics (which we don't like to predict as value investors), there could be trouble down the road for this company, particularly considering its current debt to capital ratio of nearly 50%. For someone who understands the industry well, and can appropriately value IP's assets, this may be a good time to invest. For the rest of us, we may want to save our money for companies that are closer to 'sure things'. Both Benjamin Graham and Philip Fisher had a profound influence on Warren Buffet's investment philosophy. In fact, Warren Buffett once said that he is 85% Graham and 15% Fisher. Benjamin Graham was born May 9th, 1894. Later in life, he favored studying mathematics and philosophy. At the age of 25, in 1919, he was already earning a salary of $600,000 at a Wall Street partnership. In 1926, he started the Graham-Newman partnership with Jerome Newman. It was this partnership that hired Warren Buffet in 1954. Graham wrote two classic texts on investing, Security Analysis and The Intelligent Investor. Graham wrote Security Analysis shortly after the crash of 1929 with co-author David Dodd, both of whom were professors at Columbia. The crash of 1929 destroyed much of the wealth that Graham had built to that time and had a profound impact on his approach to investing. He came to believe that downside protection is of paramount importance and led to the idea of investing with a margin of safety. According to Graham, sound investing is investing with a margin of safety. Security Analysis introduced several novel ideas. One novel idea was introduced when Graham wrote that securities are only investments if they have a degree of safety of principal and a satisfactory rate of return (he was referring to both stocks and bonds). Graham introduced his definition of the intrinsic value of a security as "that value which is determined by the facts". Graham believed that the intrinsic value is not a precisely determinable figure, but rather is represented by a range of values. Not losing money and being aware of the downside risks in a security was very important to Graham. He stressed the importance of understanding where the "solid ground" was with investments. For Graham, solid ground was established by calculating the liquidation value of a company's net assets. Graham placed most valuation emphasis on facts, rather than qualitative factors. However, Graham also recognized that the earnings power of a company was a very important factor in the valuation process. Graham's second approach to investing was focusing on low P/E stocks. Graham's approach to investing was based on the belief that securities were frequently mispriced in the market and was often caused by the human emotions of fear and greed. After the 1973-1974 bear market, Graham was invited to a money manager conference. Based on what he heard at the conference Graham wrote "I could not comprehend how the management of money by institutions had degenerated from sound investment to this rat race of trying to get the highest possible return in the shortest period" (from the Institutional Investor, April 1974). Throughout history, we see periods of economic contraction and expansion. 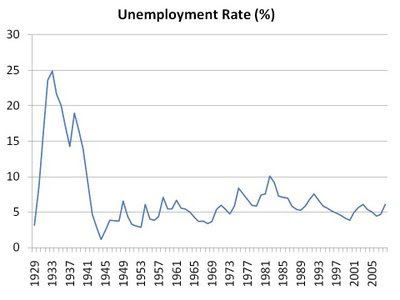 Unemployment actually touched 25% at its worst during The Great Depression, whereas right now we sit at 6.1%. How bad will it get this time? Anyone who claims to know is either lying or delusional. However, we can gather some clues from previous recessions in order to make a guesstimate. Economists consider the 2001 recession to be a relatively mild one (and we can see from the chart that the unemployment peak was fairly low by historical standards), and so most economists expect this to be a worse recession than that of 2001. During the early 80s, however, inflation had gotten out of control, forcing the Fed to fight it despite stagnant growth. This time around, inflation is at reasonable levels, allowing the Fed to do what it can to increase liquidity and promote growth, suggesting this recession won't be as bad as it was in the early 80s. Professor George Athanassakos of the Richard Ivey School of Business has written an article titled Panic of 2008 which offers his opinion on how bad things will get. While nobody can predict the future, we are not even close to the dire circumstances of a depression. Don't let the media sway you in your investment decisions. Buy when others are fearful, and sell when they are greedy. Warren Buffett's investment track record is phenomenal. It is so impressive, that Efficient Market theoreticians claim that efficient market theory is not flawed, rather, that Buffett's track record is so rare that it's a five-sigma statistical event (a 5 sigma event has a 1 in 3,488,555 chance of occuring). From a young age, Warren was fascinated with numbers, probabilities, entrepreneurial activities and the stock market. As a boy, he read stock books, ran paper routes, reconditioned and rented out pinball machines and even bought and rented out a 1934 Rolls Royce. Warren kept pursuing his interests and in 1954 he joined the Newman-Graham corporation, an investment capital partnership (along with Walter Schloss, Tom Knapp and Bill Ruane). After Graham retired in 1956, Warren, at the age of 25, started a partnership with seven limited partners. The limited partners received 6% annually on their investments and 75% of the profits above the 6% threshold. At the time of formation of the partnership, Warren had contributed $100 and the limited partners had contributed a total of $105,000. For the next thirteen years, Warren compounded the partnership's money at a rate of 29.5% per year. In 1969, Warren disbanded the partnership due to a lack of value oppportunities available in the speculative stock market at the time. During this period, it was common to find stocks trading at 50-100 times earnings. Rather than abandon the principles he understood and believed in he disbanded the partnership. In 1965, Buffett and some partners bought a controlling interest in Berkshire Hathaway, a textile and manufacturing firm. After working many years with management to turn the company around, finally he closed the textile operations in 1985. In the early years, Berkshire Hathaway provided excess cash which Warren used to make other investments. One investment that Buffett made shortly after the Berkshire purchase, was in the Diversified Retailing holding company. The retailing stores that Diversified owned proved to be facing difficult times with declining economics and eventually caused Buffett to sell it in 1987. However, Buffett capitalized on this investment by leveraging the assets of Blue Chip Stamp, which was owned by Diversified Retailing. The Blue Chip Stamp company provided retailers with a collectible stamp program for customers and this program had a float of $60 million dollars in unredeemed stamps. Warren used the $60 million in cash to purchase See's Candy Shop and Buffalo News. Both of those investments made a tremendous amount of cash for Berkshire Hathaway over the years. In 1967, Berskshire Hathaway also purchased controlling interests in two insurance companies, the National Indemnity Company and National Fire & Marine Company. Warren's sense of probabilities played an important part in how those companies issue insurance policies. Unlike many of his insurance competitors, Warren refused to have his insurance companies write policies that were likely to lose money. The insurance business is difficult, but the cash collected from policy holders provides a renewable source of cash for Warren to invest. Today, Berkshire Hathaway owns many diversified public and private businesses, due in large part to the excess cash generated by its insurance activities. When Warren took control of Berkshire Hathaway, the corporation's net worth was $22million. In 29 years, the value of the corporation grew to $10.4 billion. The annual compounded per share book value growth has been 23.3% between 1965 to 1993. Fedex (FDX) and UPS (UPS) have both faced tremendous challenges in the last year. Fedex is under fire for employee/contractor classifications, and both companies have faced soaring fuel prices and a slowing global economy. As such, the market may be punishing these very profitable companies, thereby offering long-term investors the opportunity to buy in at decent prices. 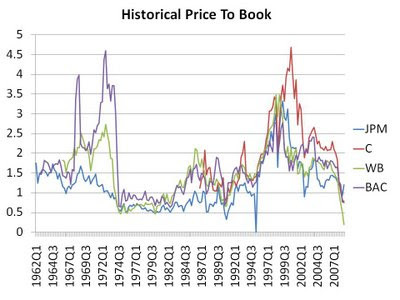 To gauge just how sour the market is on these companies, a look at their historical price to book ratios could be useful. In order to maintain and grow their operations, both companies must invest in transportation equipment, distribution centres, and technology; therefore we might expect the market value of these companies to be somewhat correlated to their book values. At the same time, as these companies increase their global scale, we would expect them to benefit from economies of scale, so we don't want to use P/B values from too far back. We clearly see the market souring on these firms, especially on Fedex. And as opposed to when we looked at the P/B values of banks and home builders, the book values of these companies are stable and not currently undergoing large write-downs. Graham uses this chapter to illustrate security analysis. A lot of data is given, which I will not reproduce in full. Rather than reproduce the bulk of the chapter here, I will try to show, at a high level, what Graham does. First, he starts by looking at their P/E in the most recent year vs. their average P/E over a series of years in the past. He shows that two appear to be priced quite high given their earnings. All show satisfactory earnings on their book value, though two (the two mentioned above as being highly priced) are somewhat higher. All have satisfactory operating income to sales, which shows the profit figure per dollar of sales. This is a good indicator of comparative strength or weakness. He looks at the maximum decline in EPS for the last 10 years as against the average of the three preceding years. The two high priced stocks had no decline, which = 100% stability. The other two had quite modest shrinkage of 8%, in a year where the DJIA declined 7%, so this is nothing to worry about. The low multiplier companies had satisfactory growth rates, beating the DJIA. The two high priced companies had greater growth. Three of the companies are manufacturing companies, and are in strong financial condition with 2:1 ratio of current assets to current liabilities (This is the Current Ratio). The non-manufacturing company had a lower current ratio, which not uncommon for the industry it is in. All of the companies have little long-term debt. One of the companies has an uninterrupted history of dividends dating back to 1902. Two of them are also quite strong, while one is a newcomer. The current dividend on the low-priced stocks were twice that of the high-priced pair, corresponding to their P/E ratios. All have advanced significantly during the past 34 years. Where the DJIA advanced by 11x in that period, these companies advanced by at least 17x, to a maximum of 528x. All suffered serious setbacks as of recently, in line with the rest of the market, but rebounded shortly thereafter. A quantitative analysis ensues, looking at the companies in the context of their industries. This is an important step, but the detail given is too long for a blog post. Graham determines that the high priced stocks are bad buys because such a large portion of their share prices are due to speculation. Additionally, it appears that their previous growth was achieved while the companies were smaller, and it will be difficult to maintain such growth into the future. Graham says that the low priced companies are the best buys here. Their current low prices are a bargain for the value of the assets of the company. The return on invested capital has been satisfactory, as is the stability of their profits. As a shareholder, you must be extremely cognizant of how the management team of your company is compensated. An ideal compensation structure pays executives enough such that they're not worried about meeting their family obligations, but otherwise aligns their interests with those of shareholders. Contrary to popular belief, stock options do not align manager interests with those of shareholders, as we've discussed here. "We had a compensation committee that spent a tremendous amount of time making sure that the interests of the executives and the employees were aligned with shareholders...because we wanted them to think, act and behave like shareholders. When the company did well, we did well. When the company did not do well, we did not do well." This is absolutely incorrect! Due to the hundreds of millions of dollars in options Fuld received, his interests were not aligned with those of shareholders (if they were, he would not have received $350 million, while the long-term shareholders are left with nothing!). Options encourage managers to take great risks (resulting in the possibility of huge paydays) with little consideration to large losses (as an option can't be worth less than zero! ), whereas compensation in the form of restricted stock encourages managers to be aware of downside risks and consider long term shareholder value. Did Fuld let Lehman tank because he made his money and just didn't care? Such an accusation is without basis. However, the excessive use of options as compensation undoubtedly encouraged management to take risks, which led to Lehman's eventual demise. University of Chicago Finance Professor Luigi Zingales is not alone in his opinion when he states "Lehman's demise was a result of its aggressive use of leverage". Aggressive use of leverage results in huge profits and huge losses...we saw them both happen at Lehman thanks to a gross management/shareholder misalignment that ended up costing shareholders, but not management. Before you become a shareholder in a company, look for its compensation structure in its annual proxy filing (a regulatory requirement), and politely decline to invest if confronted with excessive use of options as compensation for management. In the final two chapters, the authors present several case studies and practical applications of Warren's techniques. One case study is presented here. #1) What is the company's durable competitive advantage? H&R Block prepares tax returns globally and is the largest tax service in America. They have been in business for 45 years and serve more than 19 million people worldwide. They have provided the same basic tax preparation service since starting their business. Competing against H&R Block is difficult because of the scale of their global operations and the strength of their brand name. #2) Do you understand how the product or service works? An easily accessible, competent tax return service that is fast, reliable and affordable. #3) Is the company conservatively financed? In the year 2000, H&R Block could have paid off all their long-term debt with 3.5 years of earnings based on their yearly earnings at that time of $251 million. #4) Are the earnings of the company strong and do they show an upward trend? The company grew earnings between 1989 and 1999 at an annual compounded rate of 8.2% and the earnings show a definite upward trend. #5) Does the company allocate capital only to businesses within its realm of expertise? Yes, H&R Block has been investing in its core operations including opening up more offices and developing tax software. #6) Has the company been buying back its shares? Yes, the company purchased 9 million of its shares back from the public between 1989 and 2000. #7) Does management's investment of retained earnings appear to have increased per share earnings and therefore shareholder value? In 1989, earnings were $1.16/sh. H&R Block retained $7.8/sh of earnings between 1989 and 1999. In 1999, earnings were $2.56/sh. The increase in per share earnings of $1.4/sh can be attributed to the deployment of retained earnings of $7.8/sh. The return on retained earnings for shareholders is thus (1.4/7.8) 17.9%. Thus, it appears that management has done a good job with retained earnings. #8) Is the company's return on equity above average? The average ROE for American companies is given as 12%. H&R Block had an average annual return on equity of 22% over the period of 1989 to 1999. H&R Block has consistently earned a high ROE, which is indicative of a durable competitive advantage. #9) Does the company show a consistently high rate of return on total capital? During the period between 1989 to 1999, H&R Block earned a consistently high return on total capital with a yearly average of 20%. #10) Is the company free to adjust prices to inflation? H&R Block has increased prices with inflation. #11) Are large capital expenditures required to constantly update the company's plant and equipment? There are no large capital expenses for H&R block. The company has a lot of offices and much of their labor costs are seasonal. They have been free to expand operations and buy back shares with their cash flows. The authors end the book with a piece of advice from Warren: "The hardest thing in the world to do is to be patient." Wait to buy at the right price for a company with a durable competitive advantage and it will make you a lot of money. This concludes the book review and associated notes for "The New Buffettology", written by authors Mary Buffett and David Clark. When investors think of putting money in the market, they almost always think only of stocks. However, there's a huge bond market out there (consisting of corporate debt) that, depending on the economy, can offer value investors even more bargains than do stocks. For example, when we met with Warren Buffett a few months ago, he mentioned that while he saw some bargains in stocks, he currently saw many more inefficient pricings in debt markets. Unfortunately, information on debt issues is not as prevalent as it is for stocks. Nevertheless, information exists for those who seek it. Yahoo! Finance has a decent "Bond Center" devoted to corporate debt. For example, here's a look at the debt issues of The Home Depot (HD). These securities can be purchased in the same manner as are stocks, but few individual investors are aware of this market. Warren learned about managing an arbitrage portfolio while working with Benjamin Graham. Arbitrage opportunities can arise from an "event" of corporate reorganizations, mergers, spin-offs, and hostile takeovers. Before the actual "event" takes place, a spread in the market can develop between the announced sale or liquidation price and the market price of the company's stock. Warren estimates that his arbitrage activities have on average, annually contributed around 25% in pretax investment gains. Warren will typically invest in arbitrage plays when there are no suitable long-term investments to make. In the early Buffett Partnership days, Warren could have up to 40% of total funds invested in arbitrage plays. To mitigate some of the risks associated with arbitrage investments, Warren only invests after the "event" is officially announced, as opposed to when an "event" is simply rumored to occur. In terms of arbitrage transactions, Warren is believed to most interested in type that Graham referred to as "cash payments on sale or liquidation". These are special situations where a company sells its business to another company or liquidates its operations and distributes the proceeds to its shareholders. With much lower commission fees today than in the past and the availability of merger and acquisition information on the internet (such as www.mergerstat.com), it is more feasible than before for smaller investors to explore arbitrage opportunities as investments. For those interested in arbitrage investments, the authors advise sticking with all cash merger and acquisition transactions due to their less complicated structure than transactions involving non-cash payments. Warren believes that is only worth investing in arbitrage situations that you are certain will be completed. In order to guard against unforeseen risks, he prefers to invest in a large number of arbitrage plays. With this strategy, the many successful arbitrage plays will compensate for the odd loss. There is tremendous educational value in understanding what investments Warren has made and why. The price has to be right and the company must have a durable competitive advantage for Warren to make a long term investment in a company's stock. The following is a partial list of investments that were either made by Warren, through his foundation, or by Berkshire Hathaway during the period of 1998 to 2001. Dun & Bradstreet Corp.: DNB: This company sells business information to other businesses. This is a Berkshire holding believed to be purchased for $15/sh in 1999. Subsequently, Moody's Investor Services was spun-off, and in 2001 Berkshire was up 293% on the initial investment. Furniture Brands International: FBN: This company is a top furniture manufacturer in America and is a Berkshire holding. The authors believe the stock was purchased in 2000 for around $14/sh against earnings of $1.92/sh. The stock was purchased after the stock bubble burst in 1999 and in 2001 Berkshire's investment was up 79%. GPU Inc.: GPU: This is a utility holding company that distributes electricity in New Jersey, Pennsylvania and Australia. It is believed that Berkshire started buying the stock at $25/sh in 2000 against earnings of $3.25/sh. It was purchased when the cost to create electricity exceeded the price GPU could charge and the company reported an earnings loss. Nike Inc.: NKE: This is the number one shoe company in the world and it is believed that Berkshire was purchasing the stock in 1998 and 2000 when the shares were trading below $30/sh. Yum Brands: YUM: Yum owns KFC, Pizza Hut and Taco Bell. It is believed Berkshire bought shares in YUM in 2000, after the stock market crash for $24/sh against earnings of $3.65/sh. Johns Manville: Acquired by Berkshire: This company is the largest U.S. manufacturer of insulation products, roofing products, filtration systems and fiber mats. Unfortuntately for the company, they used to make asbestos products and were sued and went into bankruptcy court where 78% of the company was put into trust to settle against the suits. Berkshire bought the company for $1.8 billion against pretax earnings of $343.75 million. The companies represented on this list are all beleive to have durable competitive advantages and were purchased after a temporary company setback or a stock market panic which left the stock prices pessimistically low. When the market is pessimistic, one can buy good companies at discounts to their intrinsic values. What's a good way to tell if the market is pessimistic about a stock you're interested in? 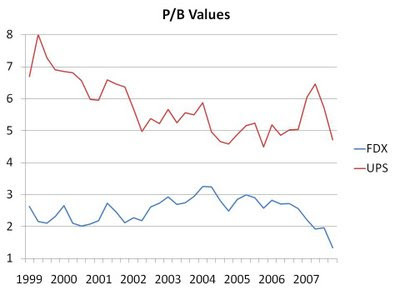 As we saw in the Chapter 7 summary of The Investment Zoo, Stephen Jarislowski suggests comparing a company's current P/E with its historical P/E to see if it trades at depressed levels. 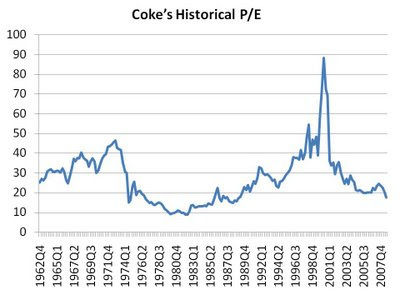 As seen here, we did this comparison for Coca-Cola (KO) over the last several decades to get an idea of where it currently trades. We see that throughout the late 70s and early 80s, one could buy banks for less than the book value of their common equity. Once again, we see banks approaching those valuation levels. Of course, one has to be cautious when considering this data. If book values are to drop (as they have been in this industry of late), then the P/B values above are currently overstated. Also, as we discussed here, the use of leverage in the banking industry makes the value of equity particularly difficult to accurately measure. Nevertheless, these weaknesses of using P/B for the banking sector shouldn't discourage you from making historical P/B comparisons for companies in industries with stable book values and medium to low use of debt levels. Warren has made most of his money by buying companies with durable competitive advantages at good prices, and then holding those investments for a very long time. However, Warren does sell stocks under particular scenarios. In the 1969, after the bull market of the 60's, stocks were trading at P/Es of 50 or better when Warren sold out of all his stock investments. He subsequently bought back when stock prices collapsed during 1973 to 1974. Similar to Warren's actions in 1969, he sold lots of stock in 1998 when P/E ratios of Berkshire's public stock holdings had once again climbed to 50 and higher. One way to think about whether selling a stock makes sense, is to compare the per share earnings of a given company over the next 10 years, to what you could earn from a bond. This comparison method between stocks and bonds will help you stay focused on the business economics of the investment. Another reason to sell an investment is if the business or environment changes such that the competitive advantage a company is no longer durable. With many companies, a shift in business or environment can be detected on the financial statements. However, with financial institutions, Warren cautions that it's nearly impossible to see impending disasters because of the ability of those institutions to hide problems. A stock price reaching its target value is another reason to sell the stock. Warren invests in stocks when particular arbitrage situations are available, and in those cases, there is a clear exit price for the investment. We are very pleased to have permission to post the following article which was recently written by George Athanassakos. This article first appeared in the Globe and Mail on October 21st, 2008, p B18. The article also appeared in Globe Investor Magazine. There is a lot of talk these days about an upcoming great depression, similar in magnitude or even more serious than the one the world experienced in 1929. While this cannot totally be ruled out, in my opinion, the current economic and financial malaise will be classified by historians as a panic similar to the Panic of 1907 and not the Great Depression of 1929. The great depression also started as a panic. Following the boom psychology and speculative euphoria of the 1920s, the great depression begun with a catastrophic collapse of the stock-market on the New York Stock Exchange (NYSE) in October 1929, which by June 1, 1932 had wiped out 83.4% of the value of the NYSE. This precipitous decline in the value of stock prices, as well as that of other assets, such as real estate and bonds greatly strained the liquidity of banks and other financial institutions. Banks sought cash by desperately selling their bonds and stocks in the market driving prices down even further. There was a liquidity crisis. Many banks were consequently forced into bankruptcy. By 1933, 11,000 of the United States' 25,000 banks had failed. This, combined with a general loss of confidence in the economy and government, led to significantly reduced levels of spending, demand and production, throwing 25 to 30 per cent of the work force out of work. There was panic. What made the panic turn into a depression was a number of errors made by policy makers and the central banks. At the time, authorities showed a great reluctance to intervene to help the economy and the markets. The then U.S. treasury secretary, Andre Mellon, did nothing. President Herbert Hoover decided to let the economy run its course as he was a strong believer in balanced budgets. And the Fed - where was the U.S. Federal Reserve? With the economy in a deep recession, the Reserve Bank of New York raised interest rates. The Fed’s errors made things worse. Countries the world over sought to protect their domestic production by imposing tariffs, raising existing ones, and setting quotas on foreign imports. This greatly reduced the volume of international trade so that by 1932, the total value of world trade had fallen by more than half. So what was panic, turned into the great depression. Is the scenario repeating itself this time around? We definitely have a panic situation. What will prevent it from becoming another great depression is that around the world governments and central banks have realized the severity of the panic and are taking co-ordinated action. Governments have taken steps to guarantee deposits and prevent a run on the banks. Balanced budget mentality is not taking hold of government actions. Governments have taken control of the situation by being willing to inject capital into the banking system and guarantee banks' loans. Co-ordinated interest rate reductions have been endorsed and carried out by central banks around the globe. Free trade is advocated as a win-win situation around the globe, despite some threats to such trade on the horizon. Financial institutions are not left to fend for themselves and have not been allowed to go bankrupt. So this panic will not be left to become a depression, exactly in the same way that the panic of 1907 did not turn out to become a depression. At that time, the Dow had doubled between 1904 and 1906. Speculation was running rampant. A “mining stock craze” ensued. Runs began on banks involved in mining speculation. Hoarding of money was widespread, as a lot of money was removed from the system during the panic. The March 1907 panic wiped out $2 billion (U.S.) from the stock market. The panic was curbed by the intervention of the secretary of the treasury, who deposited large amounts of funds in banks across the United States, but even that did not solve the problems. Municipalities and companies could not place loans and/or underwrite bond issues. The Egyptian and Tokyo stock markets crashed, and the French market had difficulties. The catalyst that prevented the panic from becoming a depression was co-ordinated actions taken by U.S. officials, but mainly by one man – J.P. Morgan. J.P. Morgan called together a group of more than 50 bankers to his home on Fifth Avenue and locked them into the building until they were willing to provide funds to stop the panic. After some arm twisting, they agreed. J.P. Morgan also contributed in other ways to add liquidity in the system either on his own or with the help of others. Eventually good banks were supported and saved and others were allowed to fail. The stock market increased by more than 45% in 1908. The United States and the world were as stunned by the suddenness and magnitude of the Panic of 1907 as they are today. But as long as co-ordinated action is taken to save banks and add liquidity to the system and that is supported around the world, the Panic of 2008 will remain just that, panic, as it was in 1907 and this won’t turn into a great depression as in 1929. Warren has found that he can purchase a privately held company at a fraction of what it would cost to purchase a public equivalent company. In particular, he has been able to buy private companies between 4 and 6 times pretax earnings thus yielding initial pretax return on investments between 16.7% and 25%. 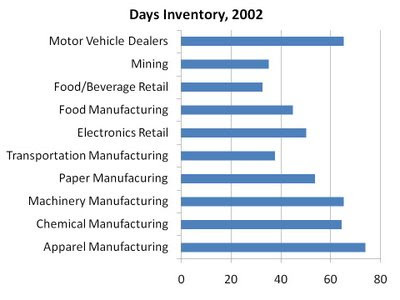 Warren has focused on purchasing companies with a long track record of successful operating history. Often these companies have a regional monopoly without the ability to expand thus making them unattractive to most of corporate America. There are tax advantages for buying entire companies. First, the dividends received from the purchased company will now be exempt from the dividend tax. Second, any retained earnings that the purchased company keeps over time, will be added to the purchase price if the purchased company is sold and thus escapes the capital gains tax on those retained earnings. A few examples of privately held companies which Warren has purchased include See's Candy and Nebraska Furniture Mart (NFM). In 1972, Berkshire paid $25 million for See's when it had $4.2 million in pretax earnings, yielding an initial pretax return of 16.8%. In 1983, Berkshire bought the majority of NFM (leaving 20% to the former family owners) for $60 million and received an initial pretax return on investment of 24%. See's Candy has a durable competitive advantage due to the demand preference for their chocolates from loyal customers (See's chocolates have been around since the 1920's). NFM's durable competitive advantage is their low cost enabled by their cheap massive retail space (paid for long ago) and the selection they are able to offer at the lowest prices (due to large order discounts). Both See's Candy and Nebraska Furniture Mart have been able to grow pretax earnings in excess of inflation due to their durable competitive advantages and have earned Berkshire a lot of money. We thought we'd take this opportunity to share some of our website's visitor statistics. Since inception, which occurred four months ago, we have had almost 10,000 unique visitors, almost 15,000 site visits, and more than 25,000 page views! We are very pleased with the strong growing interest in this site. Going forward, we will continue to strive to provide content which questions conventional wisdom, is grounded in logic as opposed to psychological biases and includes a healthy margin of safety for any investment recommendations! Please keep your suggestions and comments coming so that we can continually improve in our efforts to achieve these goals! Every few years or so the market gets pessimistic on stocks and individual companies go on sale at depressed levels. But how can investors tell if pessimism is high enough to warrant a purchase of a particular stock? In The Investment Zoo, Stephen Jarislowsky suggests looking at a company's historical P/E over time in order to determine whether a stock is relatively cheap. We can clearly see that the market is currently quite pessimistic on this stock relative to its history. We can also see what a great bargain this brand name company was in the early 80s when stocks were quite unpopular. Of course, this is far from a perfect method to determine if a stock is cheap. As companies transition from start-ups to growth companies to mature companies, one would expect that the company's appropriate P/E would actually change over time. Furthermore, just because a company's historical P/E has traded within a certain band does not mean that will continue into the future. You still have to ensure you understand the company's situation (including its financial statements) before jumping in. Nevertheless, an examination of this nature can help identify stocks that may be oversold and thus warrant further analysis. There are many sources of information that Warren uses to assist with his investment decisions. In print, Warren reads the Wall Street Journal, New York Times and Washington Post daily along with other regional newspapers along with magazines such as Fortune, Forbes and Business Week. The internet also provides many useful sources of information which Warren utilizes. Online, Warren uses Value Line Investment surveys, Moody's Stock Guides, Standard and Poor's Stock Reports, SEC EDGAR Database, Bloomberg's and PRNewswire. Local libraries often have access to reports from these informational service companies and is an alternative way of getting access to the reports these companies produce. Warren only invests in companies which he understands and thus fall within his circle of competence. Sometimes, Warren needs to increase his knowledge about a particular business in order to determine if a competitive durable advantage really exists. To learn more about a busines, Warren often uses a technique called the "scuttlebutt" method of investigating potential investments. This scuttlebutt method involves calling around to competitors and various persons involved in the business in order to increase his knowledge of the situation. The methods which Warren uses to gain knowledge in order to make investment decisions are widely available. The mainstream finance industry takes the view that stock markets of advanced countries are efficient (see Efficient Market Hypothesis), and as such it is impossible to consistently outperform the market except through luck. Though holes have been poked in this theory (including the January Effect, the outperformance of low P/E and low P/B stocks, and other anomalies), most in the finance industry are of the opinion that such anomalies are the result of data mining bias, or else disappear as they become known (since many will attempt to profit from them, thereby driving returns to zero). However, a new field has emerged that helps explain certain stock market phenomena. Researchers of "Behavioral Finance" have suggested the existence of certain deeply ingrained biases in investors that help explain anomalies which have resulted in opportunities for abnormal rates of return (which have gone unexplained by EMH). For one thing, the findings of Behavioral Finance experts suggest analysts are overconfident in their projections of growth companies, resulting in, for the most part, valuations far and above what they should be for certain high-flying firms. Furthermore, researchers have identified a phenomenon whereby investors ignore bad news, causing them to hold losers for too long (or in some cases acquiring more shares, in an effort to average down costs). While completely ignoring psychological biases when investing may be impossible, by understanding our inherent biases we put ourselves in a better position to base our decisions on fundamentals rather than emotions. For a more detailed explanation of the various forces and factors comprising Behavioral Finance, here is a link to a useful Wikipedia article. There are several categories in which investors can find companies with durable competitive advantages. The first category includes businesses that fulfill a repetitive consumer need. Ideally, the products that these companies sell to consumers are used quickly and have brand appeal. Examples from this category include brand name fast-food restaurants, pharmaceutical companies with patent protection, brand name foods and beverages, brand name household products and brand name clothing businesses. An example here is Warren's purchase of Gilette and Coca Cola. The second category includes advertising businesses that provide a service which manufacturers must continuously use. Warren thinks of advertising companies as advertising toll bridges that connect consumers to suppliers. This can include business such as advertising agencies, radio stations, television networks, newspaper publishers, magazine publishers etc. Warren bought Knight Ridders Newspapers in 1977 when the P/E ratio for this company was around 9. The third category includes businesses that provide a repetitive consumer service that are always in demand. Businesses involved in pest control, tax filing, rental services and information services serve as examples. Warren purchased Dun & Bradsteet, an informational service company which serves as an example of this business category. The final category includes low-cost producers of products that most people purchase at some point in their lives. Businesses that sell furniture, insurance, household wares and jewelry are a few typical examples of business types in this category. Warren purchased Nebraska Furniture Mart, Borsheim's, Furniture Brands International and Geico, which all belong to this business category. These companies create a barrier to entry by being the low-cost producers. Low cost retailers usually have cheap retail space (typically they have purchased their land many years ago) and can get significant discounts by making bulk purchases and then pass these savings on to the customers. By keeping profit margins relatively low, it keeps new competitors out, and allows the companies to get significant profits via volume of sales. Within these business categories, look for companies that have demand preference for their products and services with limited competition. For example, does the company compete in an industry rife with technological change? If so, early plant retirements may be part of the cost of doing business. Does the company often have to sell equipment below book value? Management may be using a depreciation schedule that make earnings look higher than they should be. 2. If you must use short-term earnings, look for things that are artificially inflating EPS. With regard to #2, this is an important aspect of reviewing a company’s financials. Basic EPS is one thing, but it is crucially important to look at the Diluted EPS, which takes into account any convertible securities that would diminish the EPS if it was profitable to the convertible security holders to do so. Additionally, you want to hunt through the footnotes to the financial statements to find special charges that should be considered in or removed from the EPS. In determining how to deal with the special charges, you should consider how they arose - are they truly extraordinary or can you expect similar charges to occur in the future? If you expect them, or similar charges, to occur in the future, then be sure to remove them from earnings when calculating Fully Diluted EPS. Beware Big Baths. Big Baths are when companies, knowing that the market already has low expectations (due to a bear market) for performance amongst companies in the industry, take special charge-offs for future losses, which then creates higher figures in the next few years when the expenses are actually incurred. Be careful, because this has the effect of skewing the way a company’s performance looks as compared to reality. This is another reason it is helpful to look at average EPS over many years. Taxes: Also pay attention to taxes - if the company has taken special charges that you do not feel are recurring, and so you remove them from the EPS figures, you must also adjust the earnings to remove the tax write-off of the special charge (which has been removed). Accounting Policy Changes: Look for any changes in the accounting policies that would have an effect on the way earnings are reported so as to artificially increase earnings as compared to previous years without actually changing anything. Depreciation policies are a good place to start (switching from accelerated to straight-line will inflate EPS), as are R&D policies (Switching from expensing to amortizing begs the question - Why switch?). Not fully reflected on the balance sheet (for conservative accounting reasons) is that the company owns an estimated 1.5 billion barrels of oil in the form of oil sands. With its cash position representing over 80% of its share price, plus its oil sands reserves, this company has the appearance of a great value play on paper. Unfortunately, there are mitigating circumstances which make this a risk! One problem is, their first project is not scheduled to come online until the end of 2011, with the next two scheduled to start around 2015. Until then, the company will be spending its cash and fast: based on its cost estimates, the company will run out of cash in 2009, and therefore needs financing soon. Although we have an estimate of the amount of oil the company will develop, what will the price of oil be when these projects come online? Along with most value investors, we don't pretend to know what the oil price will be at that time (although several months ago I did bet my friend Charles who owns AltEnergyStocks.com that the oil price will be less than $115 in five years). The initial costs, however, (before a dime in revenues is received) are quite high. The estimated Phase I costs of UTS' first project (for which UTS owns a 20% share) are over $15 billion, meaning this company will be spending a lot of cash in the next few years with little certainty as to its returns. For someone who can reliably predict energy prices (if such a person exists!) and who therefore understands the value of the oil sands this company owns, this may be a great investment. However, we only invest in companies we understand well, and so despite the current strong balance sheet and low P/B ratio, this company appears to be a risk for those of us who prefer to swing at sure things. Security analysis involves analyzing the business, its operating results and financial position, its strengths and weaknesses, opportunities and threats, future estimates with certain assumptions, comparisons with similar companies or the same company historically, and a judgment of the security’s attractiveness. Graham immediately cautions against focusing on the future estimates of growth and sales, as these are the least reliable figures we have and are most vulnerable to miscalculation. These estimates are also a large factor in the high P/E assigned to so-called growth stocks, which, as we learned in previous chapters, tend to fall the hardest. The interest coverage ratio is the chief factor in assessing the safety, or quality, of a bond. For preferred shares (which are subordinate to bonds), you must look at both the interest + deferred dividend coverage ratio to determine the safety. Graham suggests applying a threshold you feel comfortable with (generally 4 - 7 times for EBIT) and deriving the average results for 7 years, while also considering the minimum coverage shown. Property value - The greater the realizable value of the company’s assets vs. the amount of debt, the more likely the bonds will be repaid in full. To analyze a common stock, you must come up with a valuation of the share and compare to the current price. In valuing the share, you must estimate the average future earnings and discount them back. To estimate average future earnings, you look at average past data for revenues and expenses and project them into the future with sound assumptions as to the change from the past. These assumptions are based on expected growth in the general economy and the industry and company in particular. 1. General Long-term Prospects - How does this company grow? Beware companies that grow by acquisition only or have excessive cash from financing activities (e.g. WorldCom), or companies that rely excessively on a single customer. What are the company’s competitive advantages and are they sustainable? 2. Quality of Management - this is a really nebulous factor because there are no objective, quantitative tests of managerial competence. Also, it is already considered in the past performance and future estimates and long-term prospects. Graham says it should not factor into the discount rate again! 3. Financial Strength and Capital Structure - Companies with lots of surplus cash and no debt are preferred if all else is equal (e.g. share purchase price). Look at Net Income + non-cash expenses like Amortization & Depreciation. 4. Dividend Record - A long, uninterrupted record of dividend payments indicates high quality. 5. Current Dividend Rate - What is the ratio of dividend payout to reinvestment? Compare to what the company is using its reinvestment money for - if it is investing in low-return projects, then perhaps this is a sign of management ego and empire building rather than sound investment policy. A good, current article on this topic by my friends over at Barel-Karsan covers the recent Best Buy dividend revocation decision in favour of a low-ROI investment. This can be rearranged to find the implicit annual growth rate in the market’s pricing. This formula will lead to a valuation on the conservative side, which introduces a margin of safety. First, find the past-performance value - how much the stock would be worth, absolutely or as a % of the market - if we assume that its relative past performance will continue unchanged (using the previous actual average 7-year growth). Second, consider how much this should be modified due to future expectations. This process is elaborated on in future chapters with concrete examples. Due to recent volatility in the Dow Jones Industrial Average (DJIA), the public has taken a new found interest in the daily fluctuations of this index. Is the DJIA a decent proxy for the US market? It actually has several weaknesses when used in this regard. To understand why, it's important to understand how the DJIA is calculated. First of all, the DJIA is what's referred to as a price-weighted index, meaning its movements are related only to the stock price movements of its components. This means a company with a huge market cap with a low stock price has less influence on the index than a smaller company with a high stock price! Finally, the DJIA is comprised of 30 large, mature, blue-chip stocks (listed here) that are not representative of the thousands of US stocks out there. As such, its returns are not comparable to those of the NYSE or NASDAQ as a whole. In future posts we'll consider the suitability of other indexes as proxies for the broader US market. In addition to bull/bear market cycles, other events such as industry recessions, mistakes made by companies, structural changes and war can present situations to buy stocks cheap. Industry recessions can present great opportunities to buy stocks in excellent quality companies. Find the best companies that are adequately capitalized during recessions as the weaker companies may go bankrupt. During an industry recession, all the companies get hurt, but the stronger ones will survive. It may take 1 to 4 years for the industry to recover. Warren purchased Capital Cities during an industry recession after the company announced they would not grow profits in 1990. The market hammered the stock down by 40% and then Warren stepped in to buy stock in the company. Sometimes companies make blunders. Most of the time, when the market finds out about the mistake, it will mercilessly punish the stock price down. If you determine that the problem is reversible, then it can be an incredible time to purchase stock in a company that has a durable competitive advantage. Warren purchased stock in Geico and American Express after those companies had made individual blunders but when the problem was likely to be temporary. Structural changes can include restructuring, reorganizing and divestitures (spin-offs). During these singular events, the market can often take an overly pessimistic view of the situation and lower the share prices accordingly. Warren purchased Costco after it reported negative earnings due to a restructuring cost. Times of war represent uncertainty and result in falling stock prices. During war there is a lot of fear in the markets often market participants will sell-off stocks regardless of the quality of the companies. It is often possible to buy companies with durable competitive advantages at cheap prices during these times. Bad news situations often result in buying opportunities for selective contrarians looking to purchase stocks in excellent quality companies. Recently, CNBC's Jim Cramer advised his viewers to pull out from the market all funds they will need in the next five years. From our point of view, as we discussed here, this is how investors should be positioned at all times! As the market is subject to wild swings, you can't rely on the market to offer you good prices in the short-term! But the fact that Cramer recommends pulling out of stocks now, after the market has dropped, illustrates the fundamental difference between the mainstream finance industry and value investors. To value investors, stocks have become more attractive. While to those who pay little attention to financial statements in making their decisions, stock declines make stocks less attractive. Such investors are prone to psychological bias: when things are going well, they think the good times will never end; when things are going badly, they think the end of the world is near. If you understand what you're buying (i.e. the net assets and earnings power) in the stock market in the same way as you do when you make private transactions, you will feel comfortable riding out economic storms and will reap the rewards by buying low and selling high. At Barel Karsan, we are all about the concept of buying stocks for less than their intrinsic values. 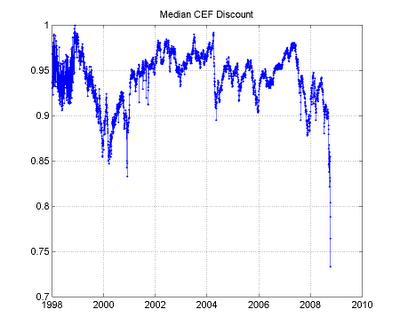 At first glance, it appears that closed-end funds are trading at tremendous discounts by historical standards. While the chart indicates that the median fund trades at more than a 25% discount to its net assets, investors must pay careful attention! If you're considering the purchase of a closed-end fund due to its discount, you must consider several factors. First of all, how up to date is the net asset value calculation? If the NAV listed is from 10 days ago, and the market has dropped since then, the price of the fund might be low but the NAV is lower than is shown. Second, many funds own assets that are not part of the stock market. In these cases, management has some discretion over the methodology used in the determination of the fair value of such securities. As was raised in an SEC speech here, fund ownership of illiquid securities can lead to NAV valuation inaccuracies that can mislead investors. We met this valuation challenge when we looked at Equus, a fund concentrating in the alternative energy space. Don't buy a closed-end fund blindly due to its discount! Understand what the fund owns, when its assets were valued, and how much you can trust that valuation (i.e. are its assets traded on a liquid public market, or is some other valuation metric used).